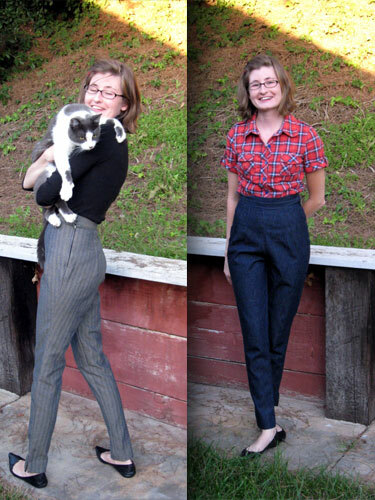 Home » 1950s » >Cigarette Pants and a New Suit! Well, I tried my hand at cigarette pants over the last few days. I have always adored the look Audrey Hepburn has in Funny Face when she’s dancing in the philosophical bar. I made these from Butterick 7557- the pic above is not actually of my pattern, but is the same number. I bought mine from Selvage Shop on Etsy. My first shot were the gray ones, but being that gray isn’t really my color I made some dark denim ones today and like those MUCH better. I have a heck of a time finding pants that fit or even making my own, so I made up a muslin, then had to fix and fix and mark them up, and still had some tweaks on the final pair, but by the time I made the denim ones I knew what to do. I’m actually quite pleased, but the hardest thing is going to be finding shoes and tops to wear with them. 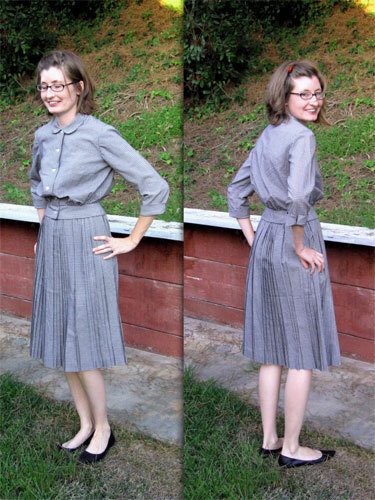 I want to make a top like on the cover of the pattern, but I’ll have to wait until I find the perfect stripe- I’m actually thinking pink and gray would be really cute, which is funny in itself because both of those generally aren’t my colors. Here’s a couple of really dorky pictures of me wearing the pants. I also grabbed my husband to take a shot of the cute suit he bought me for our anniversary! I just love it- it’s a black and white check and looks very Lauren Bacall to me. It’s probably early 50s and is by Colony Casuals of California. How fun is that name? 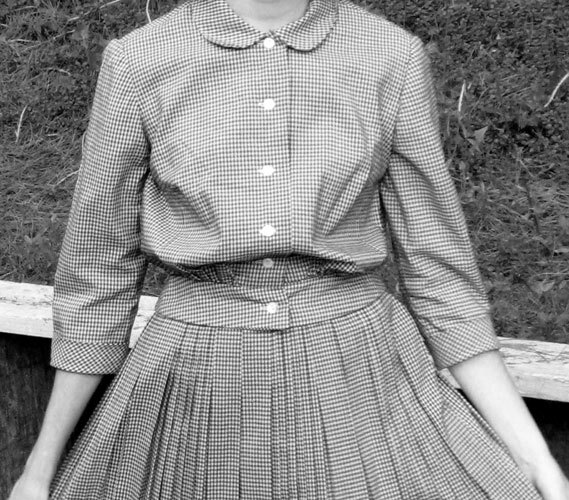 I love the pleating on the skirt- I added one close up so you can see the pattern. Please forgive my makeup-less hair messy self- I’ve been cutting out plaid on the bias today on my hands and knees and usually don’t care that much if I’m put together. And I guess as a last thing I uploaded some things over the last week or two to the etsy store so here’s a little widget with a preview. I’ve got a few more things coming- hopefully I’ll start my vintage magazine destash in the next few weeks. « >Two 1950s projects finished! 5 Comments on >Cigarette Pants and a New Suit! 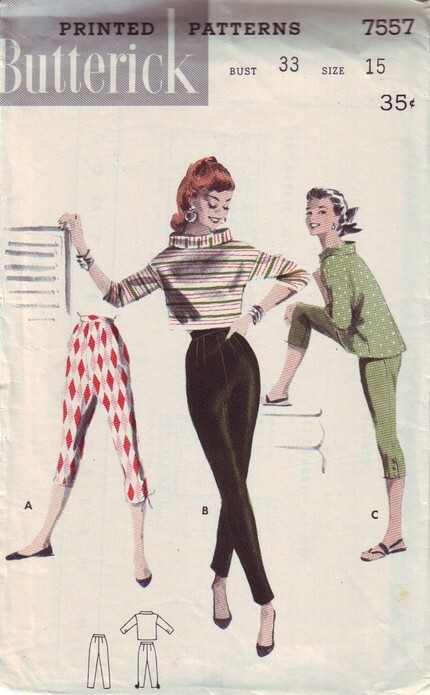 >I am so, so happy to see cigarette pants made up, because I could only envision them in my head as horrible 'mom jeans' and they do not look that way at all on you!They look so cute and this really inspires me to give them a go!As for tops to wear with them, I love those 50s blouses that are wraps and have the big tie around the waist! Whenever a pattern pops up on Etsy it sells right out. >You rock those cigarette pants! I'm so impressed by your sewing AND tailoring skills!